We’ve all been there. The dreaded sound of a raging alarm goes off and you hit the snooze button. But just once. Okay twice. Alright six times. And now it’s too late to make it to the gym before work. But how could this be? You swore to yourself last night that you were going to make it to the gym this morning. Well sometimes it takes more than an oath to exercise in order to get yourself out of bed in the mornings. So for those of us who would rather stay trapped under the duvet until the sun is high in the sky, here are 5 tips to get up for your morning workout. If you know you are going to workout in the morning, save some time and wear your workout clothing to bed. That way when you wake up, you’re already dressed and ready to go. You can use the extra time you saved to either get a little more sleep or add a few more minutes to your workout. Either option is beneficial to you. A comfy cotton t-shirt and a pair of shorts or yoga pants is the perfect outfit for both sleeping and sweating. If you are consistently going to bed at one or two o’clock in the morning, early workouts are never going to get easier. Start training yourself to go to bed earlier by moving up your bedtime in small increments every night. This means putting away the laptop, turning off the TV, and avoiding those late night food cravings. The more often you do this, the easier your body will adjust to going to sleep earlier. It will also make waking up easier and your workout more effective. Not very many people can wake up groggy and tired and put in an intense workout immediately after. Getting seven to eight hours of sleep at night is critical in order for your body to perform well the following day. This may seem like a simple and obvious idea, but it really does work. 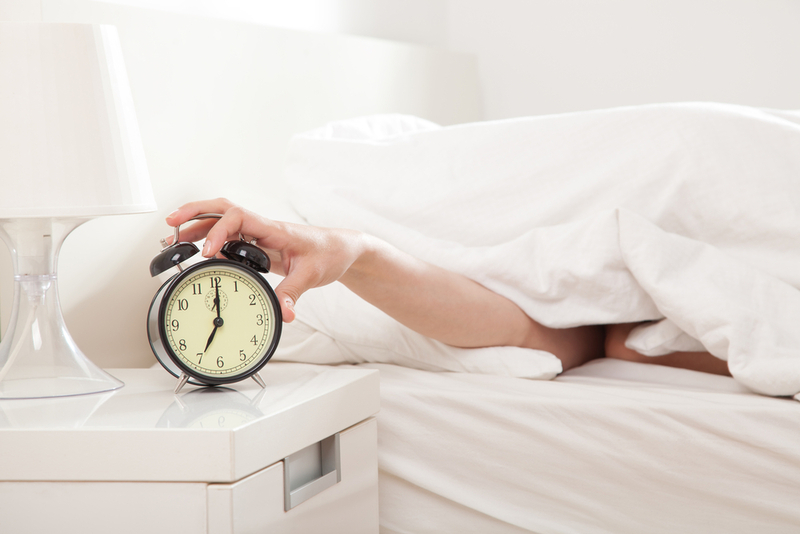 It is so tempting to hit the snooze button over and over again if your alarm is right within reach. Forcing yourself to get up and move around will help you to wake up and avoid the lure of staying in your comfy bed. Sometimes knowing that there is a treat waiting for you at the end of your workout makes getting up that much easier. Allow yourself to grab a Starbucks after a good morning run (avoid the beverages loaded with sugar), or treat yourself to a new workout tank after a weeks worth of training. Knowing that there is a light (or a cup of coffee) at the end of the tunnel will give you that much more motivation to power through your workout. Take caution with how you treat yourself though; don’t blow your whole workout on a plate full of greasy bacon or a Grande Frappuccino with a mountain of whipped cream. Keep everything in moderation. Try some of these delicious recipes for both pre and post workout meals. There are numerous benefits of an early morning sweat session that make getting out of your warm bed worth it. Morning workouts get your metabolism going which means you will be burning more calories all day long. A simple breakfast beforehand like a piece of fruit and a cup of Joe will also help to fire up your metabolism for the day. While getting out of bed at the time may be exhausting, exercising in the morning will actually increase your energy for the rest of the day. It will also increase your mental acuity, which will help you to stay focused and sharp throughout your workday. Finally, scheduling a workout for the morning will ensure that you make it to the gym. Often times, if you try to save a workout for later in the day, you end up running out of time, losing motivation, or becoming too tired. If you get your workout out of the way in the morning, your body will thank you for it for the rest of the day.